For some of you—you’re new here, just trying to figure out where the EMU is (or, what the EMU is!). For others, it’s as familiar as your oldest jeans. 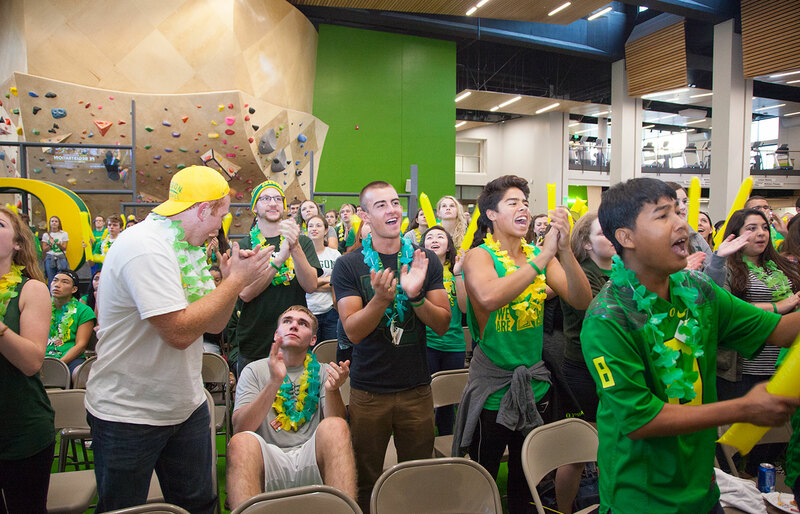 There's a lot going on around campus and it is sometimes hard to decide between the many choices: should you play soccer on an intramural team or go to the Student Recreation Center to work out? Should you check out the Ducks After Dark double feature or check out a speaker in the EMU Ballroom? Should you grab a coffee and study for your midterms or watch the game? And, how do you even find out about all those choices? Whatever you choose, get involved. Whatever you choose, get involved. On-campus living is more than just good food and convenience. You’re living with people from all over the world who are students at the UO, just like you. Join an Academic Residential Communities, study in the lounge or explore campus together, enjoy a meal with your roommate, and make the most out of your on-campus experience. The Erb Memorial Union (EMU) is the heart of campus. It’s your place to study, eat, and come together as a community. The EMU is also home to 250+ student groups, diverse cultural events, and everything else that makes the UO such a vibrant campus. While the EMU is currently under renovation and expansion, new things are opening every day. Keep coming back to watch it all unfold. Opportunity for involvement is limitless. The 250+ student groups on campus offer a variety of experiences for you to add to your college experience. Whether you're interested in music, dance, theatre, politics, or the environment, there are opportunities for you to get involved and connect with other students on campus. Don't see a student group that fits your interest? Grab some friends—or make some new ones—and start your own!